Workers prepare to remove the 14-year-old linear accelerator at the HaysMed Dreiling/Schmidt Cancer Institute to make way for new equipment that includes Stereotactic Body Radiation Therapy capability. 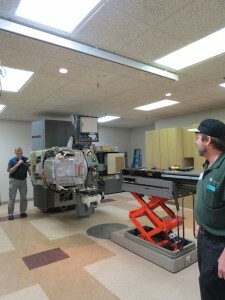 The 14 year old equipment was removed in late January and the new linear accelerator installed this week. During the next few weeks, it will be subjected to a series of rigorous tests and ready for the first patient in late March. 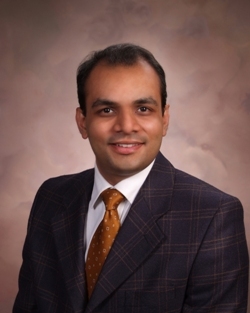 In the interim, Dr. Prasad has continued to see patients for consultations and follow-ups. Patients needing treatment have been referred to a cancer center in Kansas, Nebraska or Colorado – whichever is geographically closest. Donations can be sent to the HaysMed Foundation, 2220 Canterbury Drive, Hays, Ks. 67601 or by visiting www.haysmedfoundation.org/envision. 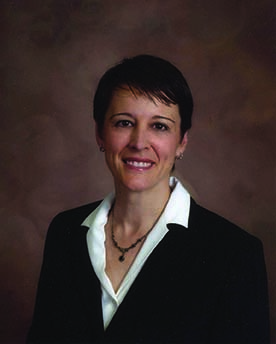 Dr. Christine Fisher at Hays Medical Center implanted the first leadless defibrillator in Western Kansas. The Boston Scientific S-ICD (subcutaneous implantable cardioverter defibrillator) provides protection from sudden cardiac arrest while leaving the heart untouched. This system continuously monitors the heart’s activity and delivers a shock in a life-threatening situation. Hays, KS – (Feb. 9, 2015) The Center for Health Improvement announced today that is has been re-certified by the Medical Fitness Association, the country’s leading organization dedicated solely to medically integrated wellness and fitness facilities. This certification is a significant step forward in providing for the health of the entire community and to the individuals taking responsibility for their personal healthcare. Currently there are 34 United States certified facilities and 18 International facilities, Hays being the only one in Kansas. This program is the first and only certification offered specifically to facilities in the medical fitness industry—an industry that serves over 4 million members worldwide. Based on the Medical Fitness Association’s internationally recognized Standards and Guidelines for Medical Fitness Facilities, the certification process involves an in-depth , on-site review of a facility’s adherence to the prescribed standards and guidelines. The certification process is an integral part of ensuring that facilities provide a high level of quality and safety in the programs and services they deliver in order for them to become fully integrated into the local continuum of health care. The Medical Fitness Association Facility Certification is recognized as a mark of excellence in the health and wellness industry. The Center for Health Improvement opened its doors to the community in February 2002. The facility houses a fitness center which includes state of the art equipment, aquatics area, the latest group fitness classes for all levels, full service juice bar and play center areas. Fitness amenities include Personal Training, Massage, Health Coaching and Nutritional Consults. The facility also houses Outpatient areas such as Cardiac Rehab, Physical and Occupational Therapy, Sleep Center as well as the Hays Orthopedic and SouthWind Surgical Clinics. For more information, call The Center for Health Improvement at 785-623-6340 or visit our website at www.thecenter.haysmed.com.